Now you can edit your digital photos and graphics very easy and comfortable with this innovative photo editing software “FotoWorks XL“. The extensive functions for photo editing with this easy photo editor are arranged in a very clear menu structure and for better control you can see always the original picture and the edited version of your pics! 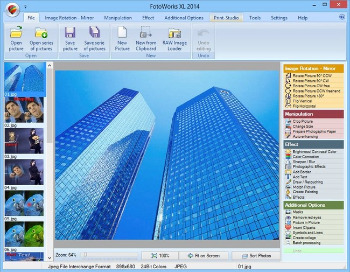 Fotoworks XL 2 photo editor is particularly suitable for beginners of all ages, but also for advanced users.